I never know where this blog will take me. And let me say upfront, I know I have been blessed by God and by you. It’s all so humbling, knowing it comes as a divine gift and also from your kindness. Here’s where I tell you I need your help. 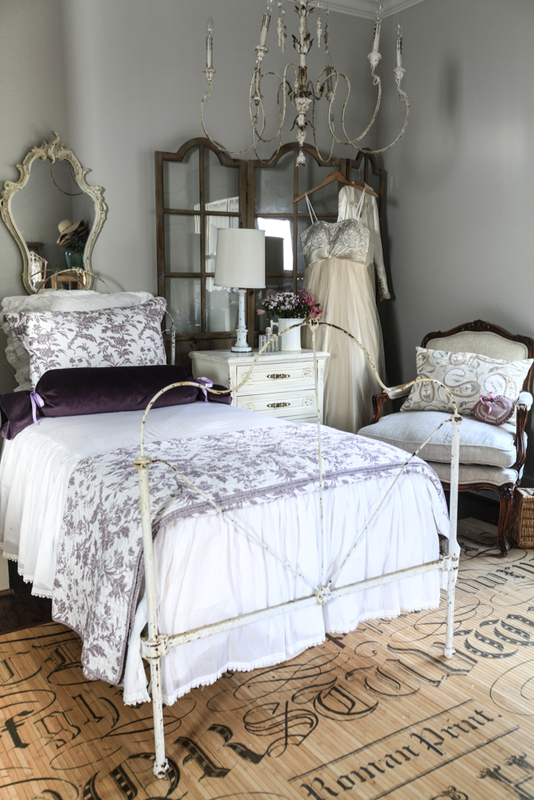 My dream for many years (ever since I dared to dream it) has been to design things, decor items, fabrics, rugs, and more. 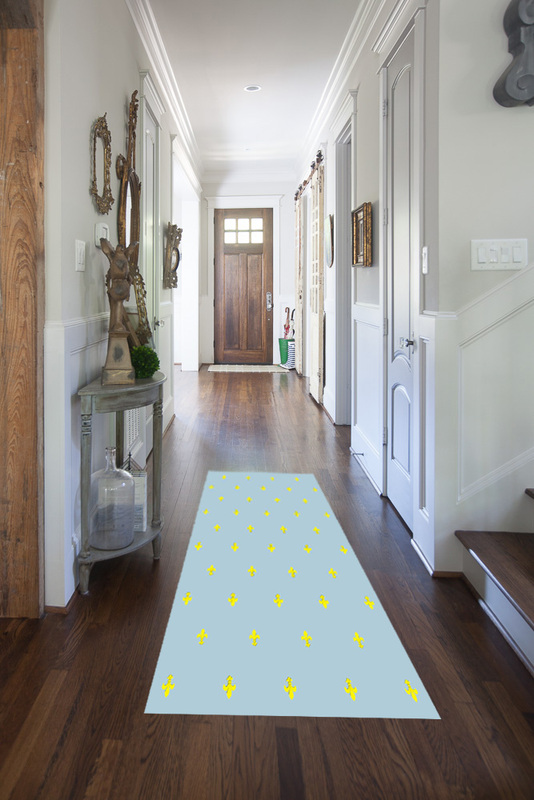 Then, Annie Selke, the maker of Dash and Albert rugs, invited me to join their first ever rug design challenge. 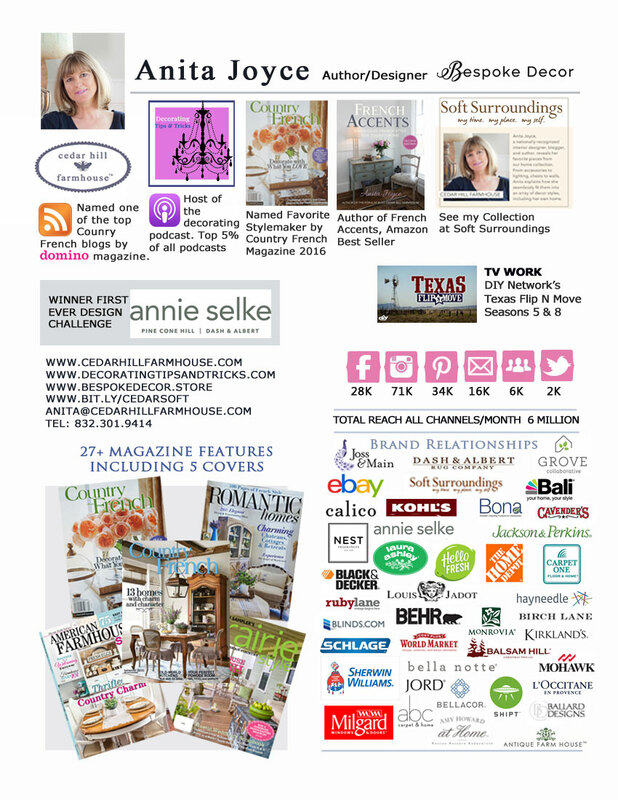 I am one of 14 design bloggers in the challenge. We each are submitting 3 designs. I mentioned it HERE. 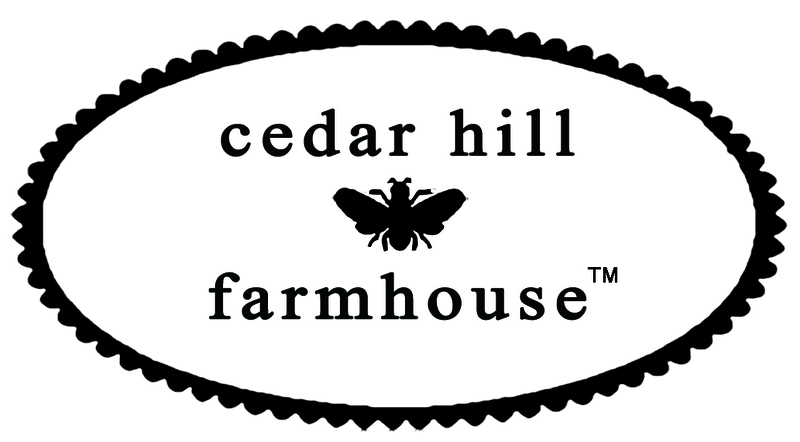 The winning 10 designs will be made into rugs and introduced at High Point next year. The voting began yesterday and will continue until Jul 30. Simply like the photos shown on the links below on Instagram. Here are the designs I submitted. 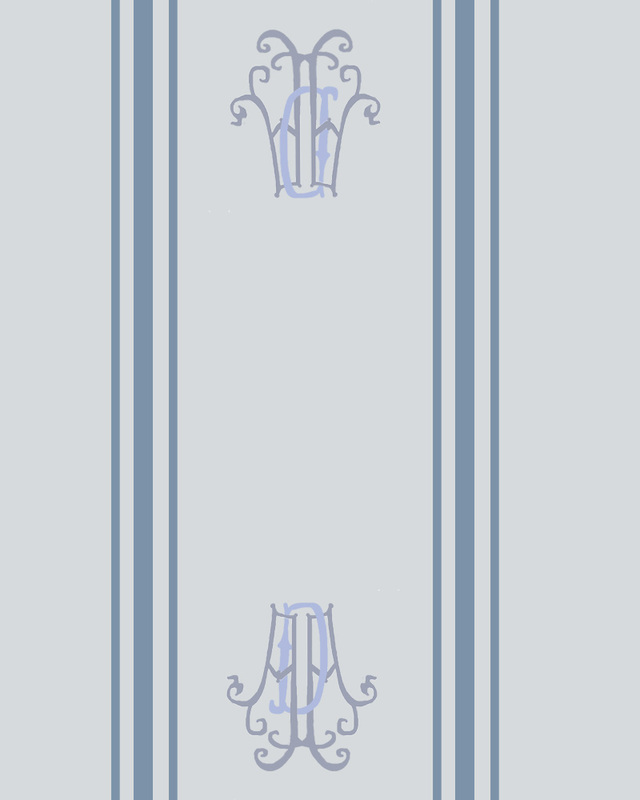 This first one is based on the French royal naval flag. I drew my own fleur de lis and turned them in the portrait direction rather than landscape. I also rotated every other row, so there is no top and bottom of the rug. 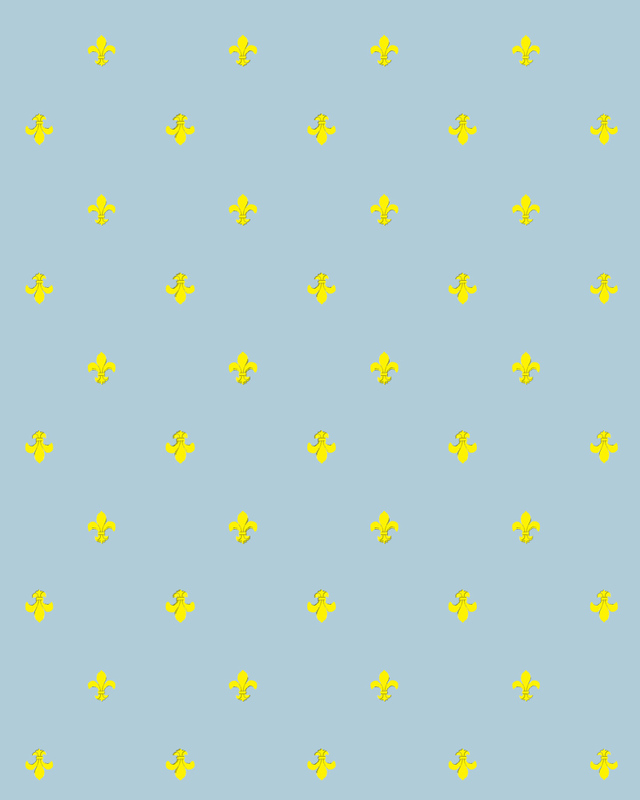 I added a duck egg blue background, and spaced the fleur de lis further apart. Here is what it might look like in my hallway. This next one is obviously based on grainsack designs. I collect grainsacks and most are not monogrammed, but some are. I love those! Here is one of my favorites. I drew a monogram with a D & A with an extra A. D and A stand for Dash and Albert. I went with two sets of stripes rather than just a center tripe. Here it is in my hallway. Well, it’s not there really. This is something I did in Photoshop to show you what it would look like. 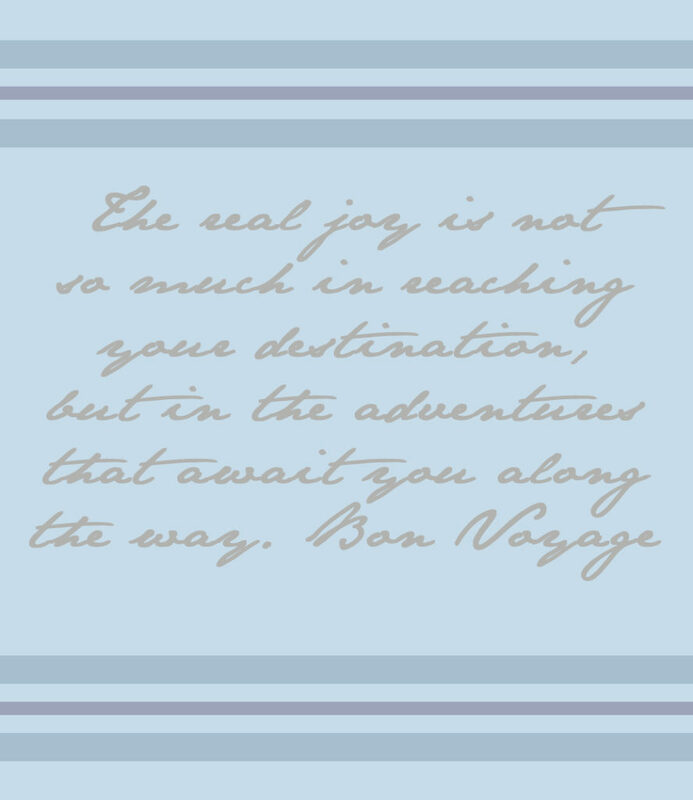 Lastly I went with a quote. 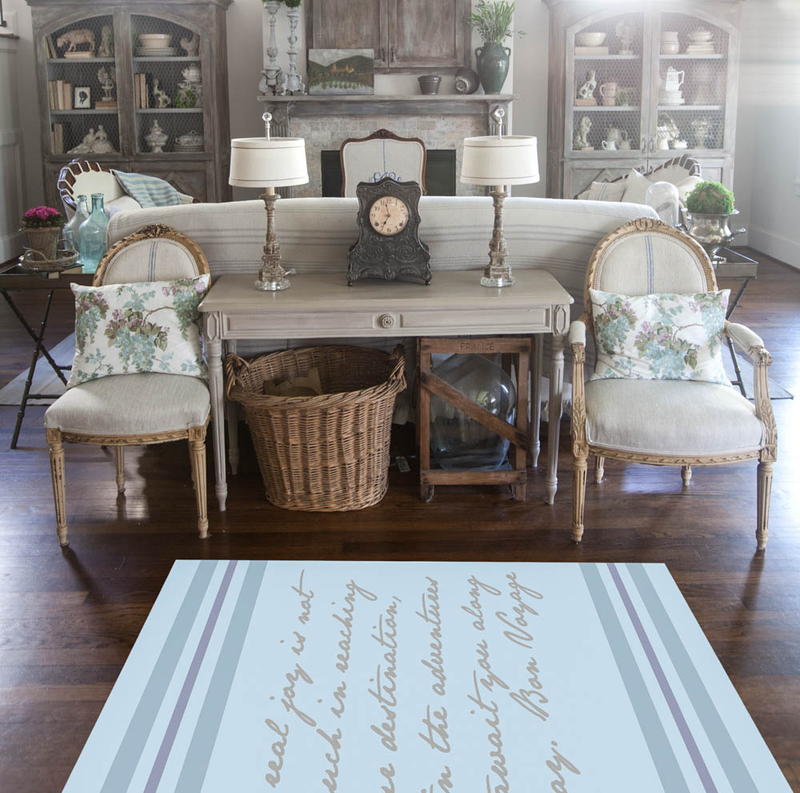 I love everyone loves my font rug, and so I did my own rendition of a rug with text. It’s Friday, so I have a new podcast episode for you today. 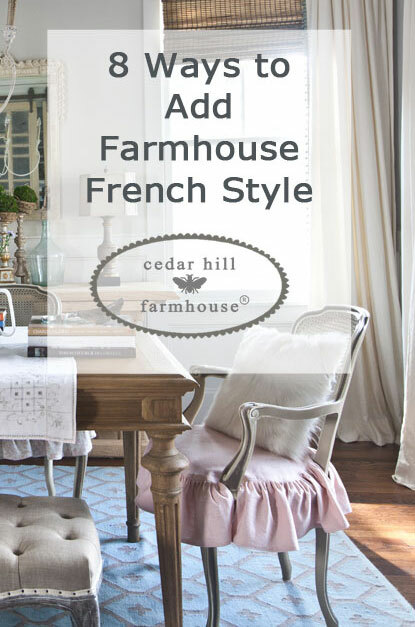 Get my ebook, 8 Ways to Add Farmhouse French Style and 3 more bonus PDFs. You'll also be signed up for my updates... it's all FREE! Oh Anita-I love them all but realllly love the grainsack inspired one!! Just voted-good luck! 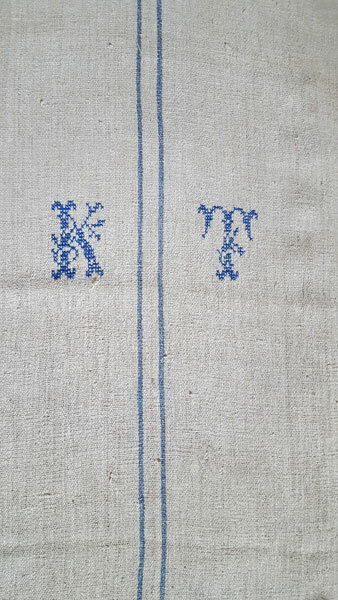 I love all your designs – my favorite is the grainsack inspired. Best of luck – I am off to vote ! All three are nice, but my favorite is the greenback one. Good luck!! Most of your designs will show soil easily. Will you walk on these? 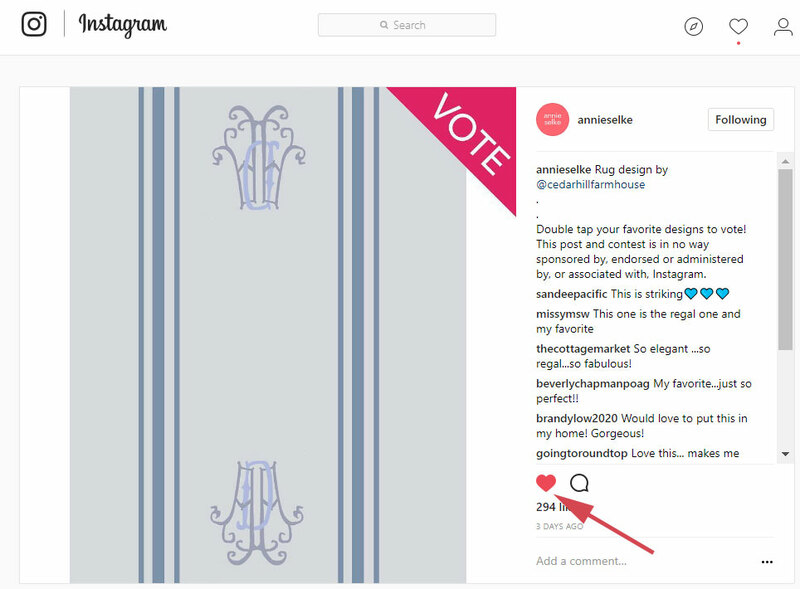 Sherry, please vote for my designs on Instagram! The only one that comes close is the grain sack inspired rug. Even that one I feel is too light for your house. 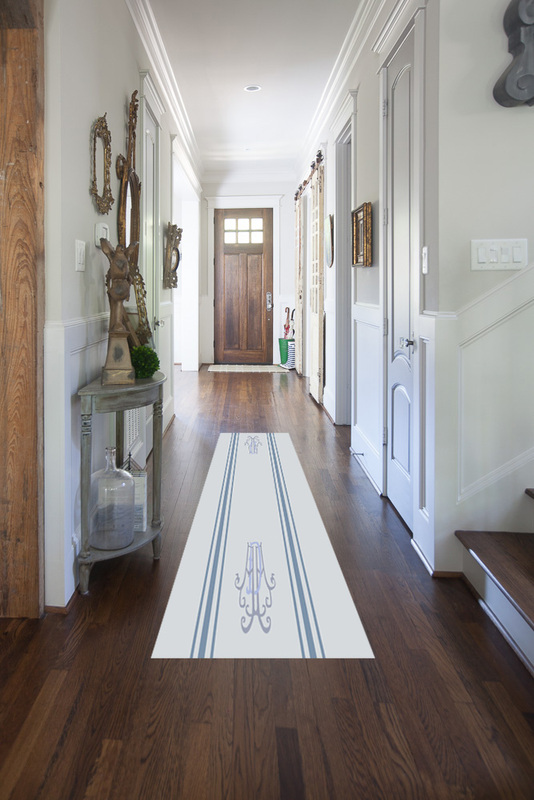 I say no rugs at all – show off your beautiful floors! 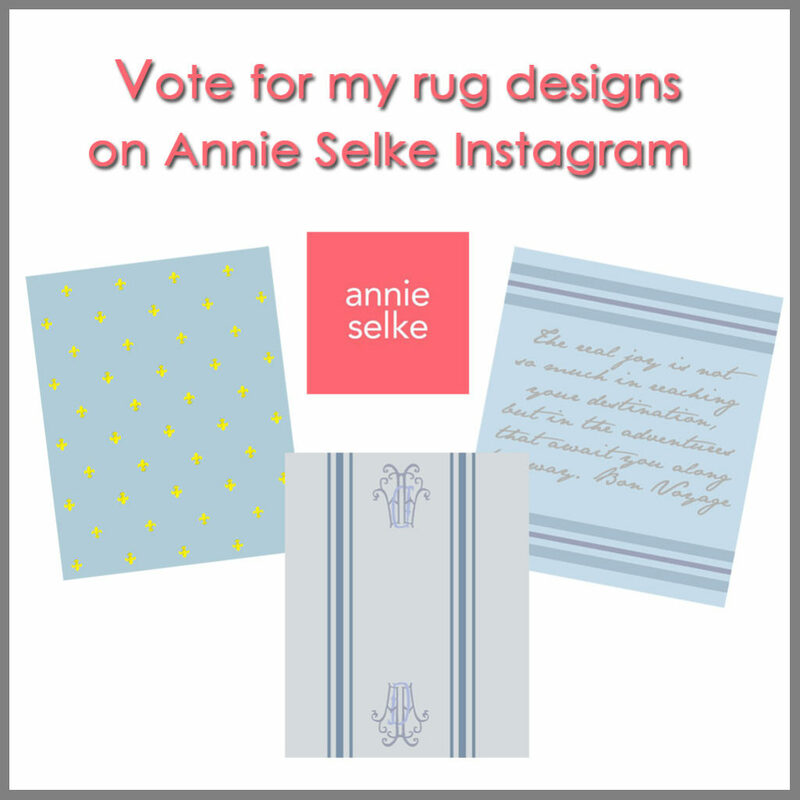 Mary, Please vote for my rug designs on the Annie Selke Instagram account! I need the votes!! I love the grain sack inspired the best. Thanks Marsha, please go vote on Instagram. I am in desperate need of votes. Will be voting! Crazy about the grain sack design although I like them all! Thank you Renee!!! I appreciate it so much! 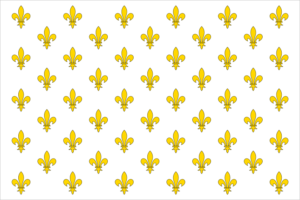 I like all three, but I really love the fleur de lis. I was hoping you’d make one just like it! I voted for all three. How often can we vote? Goodness gracious, Anita. I love them all, but the quote has me swooning here in Virginia. LOVE it!!!!! Thanks Deb. 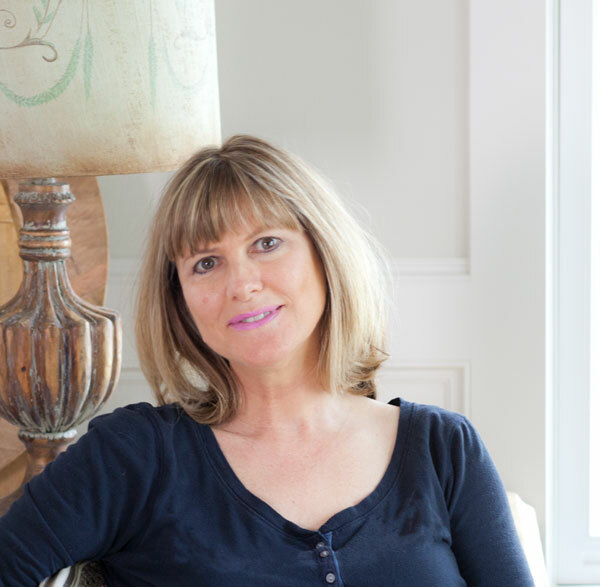 Did you vote over on the Annie Selke Instagram page yet? I just voted for your grain sack rug! You did a wonderful job on all three rugs, too…Good Luck! Thank you Debra!! Hugs to you. Done! It’s the grainsack one for me….good luck! Liked them all but especially loved the grain sack inspired rug. Voted for all 3. Can I go back and vote more than once?? If your rugs are selected to be produced I am hoping for s black and cream version of each one. I would then purchase all 3. Thank you so much Michele! You can only vote once! You are so sweet!!! I love them all and like the duck egg blue the best, I think. I just voted. Good good luck ! I love all three but my fave is the grain sack. It’s so you. I’ve voted. I voted and love your designs! My fav is the fleur de lis one! Going to vote now, good luck!!! I just voted and you’re clearly the winner! Good luck!!! The grain sack inspired one with the blue stripes! It’s beautiful and elongates the space. Voted for all 3! They are all nice, but I really liked the grain sack and the one with the quote. The grain sack is so crisp and clean looking, but how would an individual ever keep it clean? My house is a “No Shoe Zone” and I don’t know if it would survive in my house and it’s only my husband and myself as we are empty nesters. Good luck! Thanks Melissa! If the rug gets chosen, I’ll see if they want to do a darker version. Sorry , I just saw the post and they all look great!!! My favorite are the grain sack and the script!!! I hope you win!!! I’m so glad you’re here!! 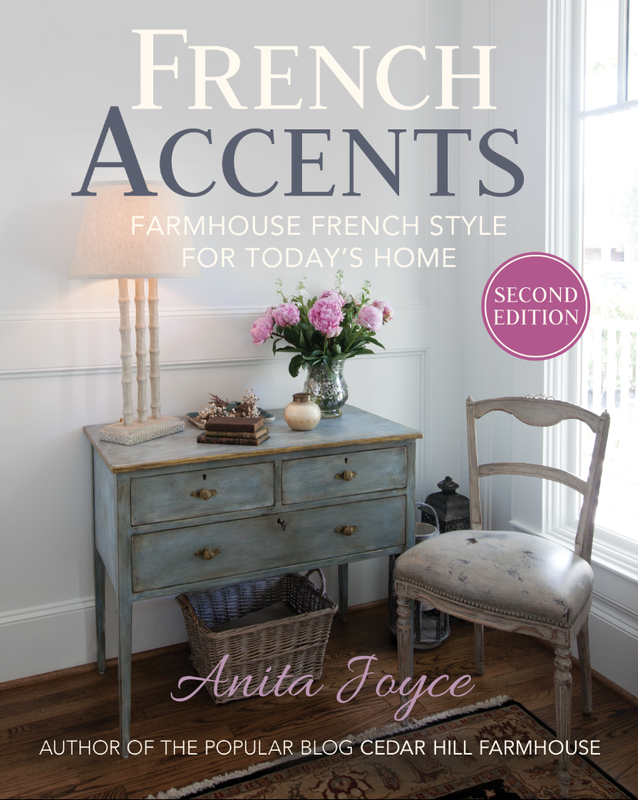 I’m Anita, author of the book, French Accents, Farmhouse French Style for Today’s Home. 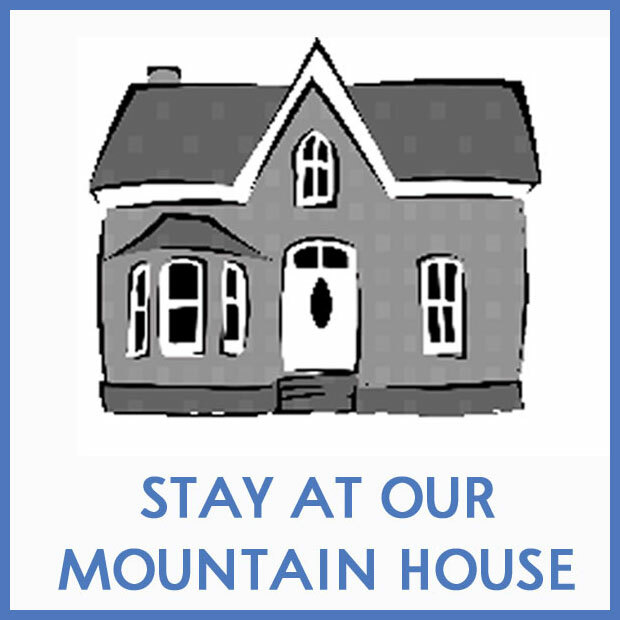 Check out my ABOUT page. 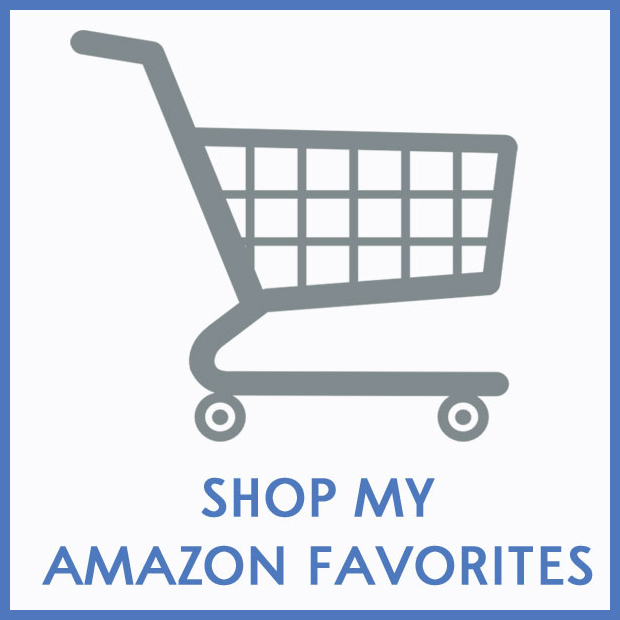 You might enjoy my book, podcast, shop and MORE! Perform any project shown at your own risk. The author assumes no liability for loss or damage that result from these projects. If unsure, seek professional advice before attempting any project.